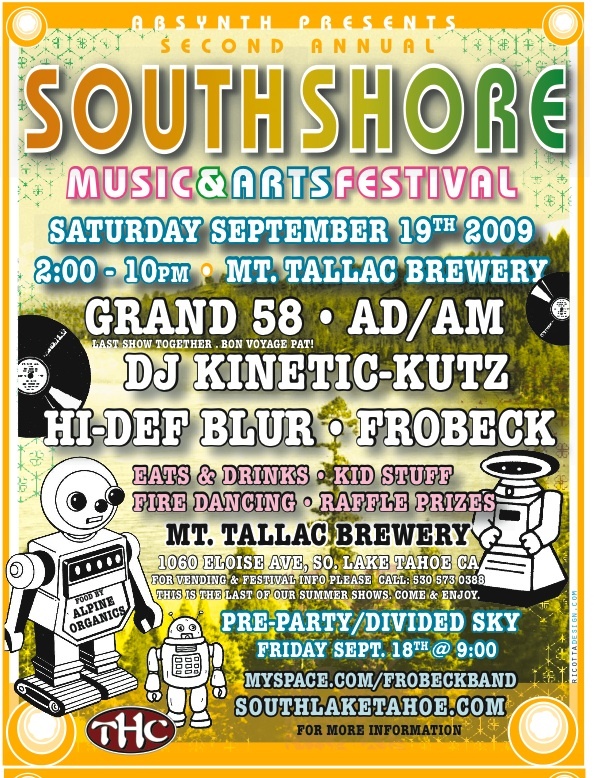 Absynth Presents the 2nd annual South Shore Music and Arts Festival, featuring performances by Grand 58, AD/AM, Frobeck, Hi-Def Blur, and Dj Kinetic-Kutz. Food will be provided by Alpine Organics Chef Company and drinks provided by Mt Tallac Brewery. There will be a live mural being painting, fire dancing, raffle prizes, as well fun kiddie stuff. This will be Grand 58’s final performance. AD/AM is a local drum & bass DJ, and Hi-Def Blur is an amazing new project featuring former member of Absynth, that plays a new rock jazz style of music. Frobeck is a San Francisco funk band that won battle of the bands this past summer for all of the bay area. Dj Kinetic-Kutz is a dub reggae DJ from Humbolt county. The festival will begin at 2pm and end around 10pm. All ages are welcome, but you must be 21 to drink. Vendors will include the Tahoe Hemp Company, South Shore Fitted, and Tahoe Rock School among others. 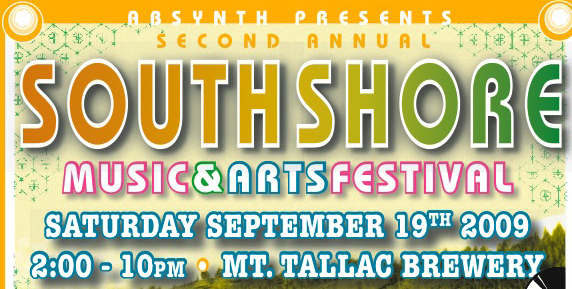 Win Tickets for the South Shore Music and Arts Festival! There are two ways to win! Visit our Facebook page and write on our wall that you want to win tickets! Follow us on twitter too, and tweet the phrase below to enter! Contests ends the morning of Saturday the 19th, the day of the event at 9am. We had a great time sharing our screen printing and fire performance with you at the festival! Thank you for the opportunity to share our art Please keep us in mind for future events!